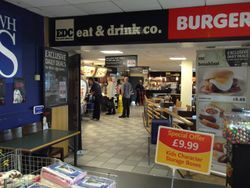 A northbound-only service area which started out small but has grown with time. Southbound traffic should use Roadchef's Killington Lake. First two hours free for all vehicles, after which cars must pay £15 and HGVs, caravans and motorhomes £20.50. HGVs can pay £22 to include a £10 food voucher. Prices are paid using PayByPhone - more details. The location code is 2430. Inside, the building is very small. The services opened on 23 October 1970, operated by Mobil. It was described as "disappointing and unimaginative" by inspectors, especially as the building didn't take advantage of the views. Mobil settled on a simple design which offered fuel and service facilities from either ends of the same building. That design had separate doors for the toilets and for the restaurant. Moto tried to encourage customers to use both by building a glass cage around the front, creating a walkway. In 1977 Egon Ronay rated the services as "appalling", calling it "drab and simply furnished". In 1978, a partnering Burton East services was considered, but cancelled due to low traffic levels. 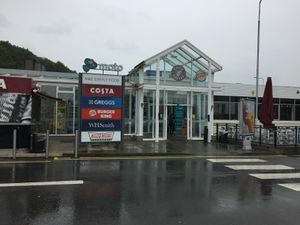 In 1996 Extra applied to build a southbound service area opposite the existing one, but their plans were refused as there were now enough services nearby. The location of the services had been chosen by the Ministry to catch Lakeland traffic. The idea of having it on one side of the road only reduced the environmental damage, and encouraged operators who might not want to invest in two buildings. Custom was expected to be very low, so only a £30,000 investment was requested and a very short lease was offered. Bids to run the services came from Mobil, Shell and a company called Alpine who made a promising bid. Mobil made an excessively prestigious bid to allow them to break in to the market. The Ministry felt that a forecourt operator would do the best job as traffic levels on this section of the M6 were expected to be low, so initially only a forecourt would be required. The winning bidder could then decide when and who would build the main facilities. Mobil decided that they would run the main services, but later sold them to BP. BP decided to keep the petrol station and lease the rest of it to Granada, now Moto.